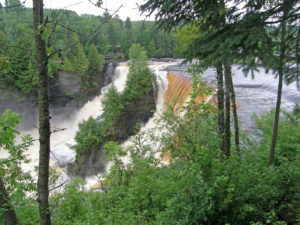 In about 1684, Daniel Greysolon, Sieur du Lhut, established a trading post near the mouth of the Kaministiquia River. French authorities closed this post in 1696 because of a glut on the fur market. In 1717, a new post, Fort Kaministiquia, was established at the river mouth. The post was abandoned in 1758 or 1760 during the British conquest of New France. 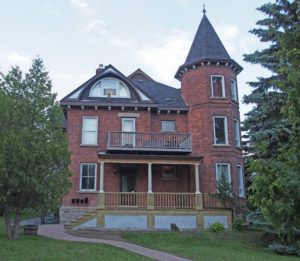 In 1803, the Nor ‘Westers established a new fur trading post on the Kaministiquia River and the post was named Fort William in 1807 after William McGillivray, chief director of the North West Company from 1804-1821. After the union of the North West Company with the Hudson’s Bay Company (HBC) in 1821 most trade shifted to York Factory on Hudson Bay. Two townships (Neebing and Paipoonge) and the Fort William Town Plot were surveyed in 1859-60 and opened to settlement. By 1883-84, the Montreal-based CPR syndicate, in collaboration with the Hudson’s Bay Company, clearly preferred the low-lying lands along the lower Kaministiquia River to the exposed shores of Port Arthur, which required an expensive breakwater if shipping and port facilities were to be protected from the waves. The CPR subsequently consolidated all its operations there, erecting rail yards, coal-handling facilities, grain elevators and a machine shop. 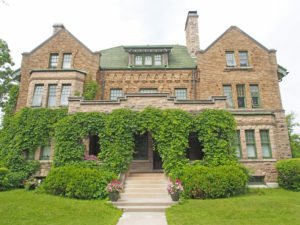 216 Brodie Street South – The Brodie Resource Library, which opened in 1912, followed the architectural guidelines established by its benefactor, Mr. Andrew Carnegie. Resembling Palladian Renaissance architecture, the library’s symmetrical staircase entrance was embellished with a pair of Ionic columns enclosed by pilasters. 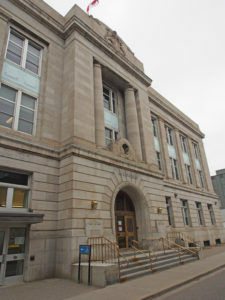 Carnegie approached library design with symbolism in mind, and the staircase entrance was supposed to have denoted a person’s rise through intellectual learning. Brodie Street Resource Library’s entrance was renovated in 1966 to permit accessibility, and the pilasters were changed into square piers. The overall composition of the exterior is Neo-Renaissance in character. Red brick and limestone pilasters and columns rest on a heavy stone base. Arches and columns arranged symmetrically about the main entrance support a bracketed cornice. The cornice in turn supports a brick parapet which corresponds to the Renaissance balustrade. Other notable architectural features of the library are the arched windows and their surrounding decorative stonework, the stained-glass windows depicting famous authors, from Dante to Ibsen, the parapet inscribed ‘Public Library,’ and the ornamental scrolls which adorn it. 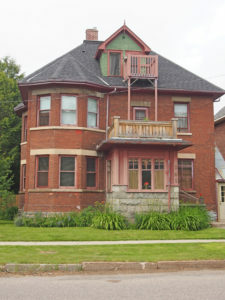 135 Archibald Street South – Vernacular style – The house which stands on the corner of Archibald and Miles Street was first owned by Sarah Jane and George Coo. It is thought that George designed the building which has an elegant and eclectic feel. The jutting turrets, arched entranceway and quarter-wheel windows are features which one wouldn’t expect on such a modest-sized structure. 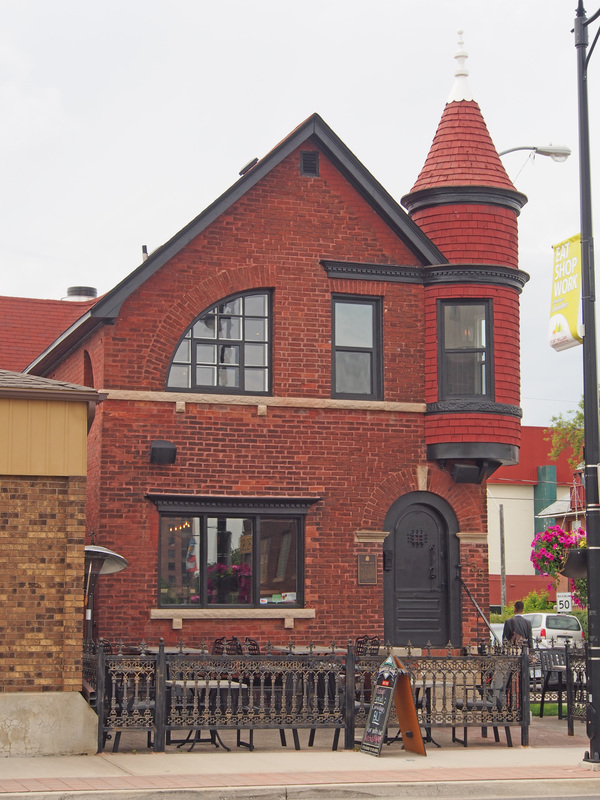 The house is characterized by an ostentatious conical turret with faux brickwork façade. 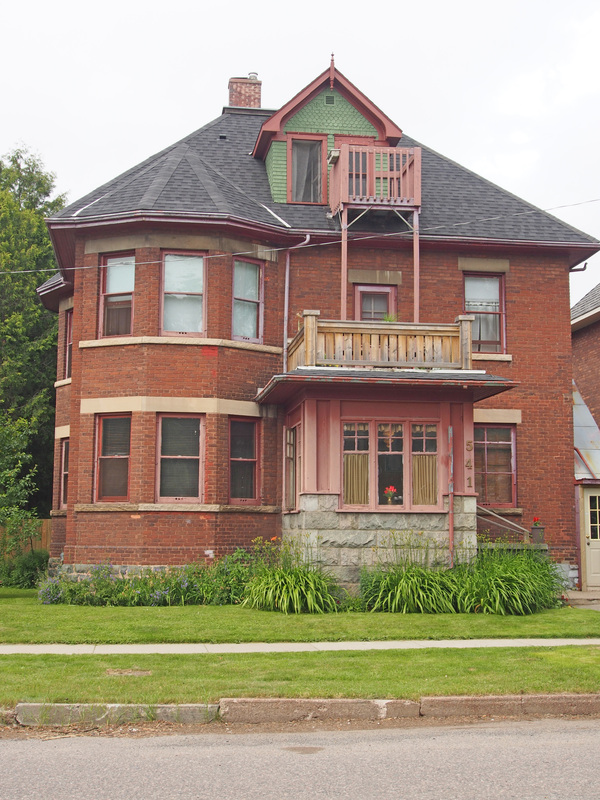 The windows are all of varied shapes and sizes, lending themselves to the overall eclecticism of the house. The large window on the main floor has a shelf entablature above it; there is also a large stone sill supported by brackets. Above the double-hung window on the second level is a molded shelf which begins rather abruptly and continues around the turret. 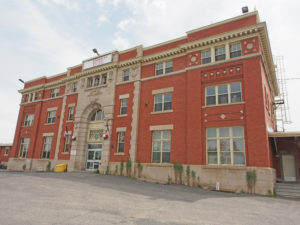 701 Victoria Avenue East – The Chapple Building – In 1913, Fort William was designated the headquarters of the Grain Commission. A prominent building was constructed in the community with the facilities to handle and inspect grain. 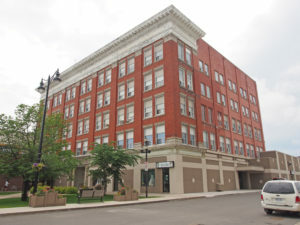 The structure housed offices on the third floor and the bottom two storeys were rented to the Chapples Company as a department store. Chapples sold everything from “lady-ready-to-wear” to “hardware” and upon its opening in this building boasted a staff of one hundred. The façade of the building features Classical detailing. Some of the architectural features are large scale dentils located on the metal projecting cornice and brick piers with stone relief capitals creating seven bays. 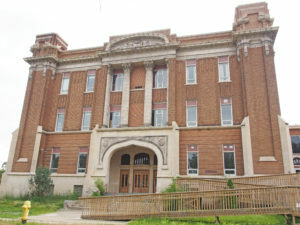 The building has a recessed entrance with Doric columns. 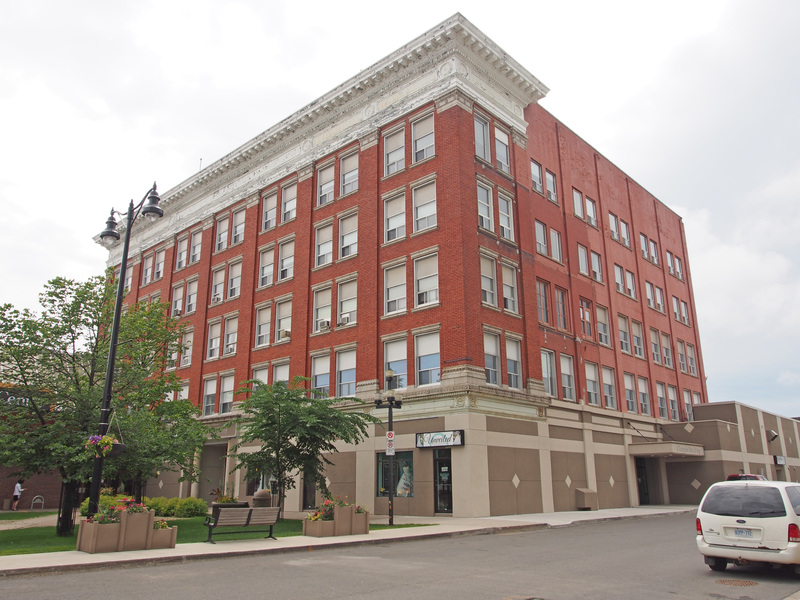 114 May Street South – Upon completion in 1929, the Royal Edward Arms hotel had 105 rooms, each furnished with a bath and there were an additional twenty-one simple rooms which were available for day rental. The dining room seated 150 people and the kitchen was well equipped to deal with busy dinner hours, with a dishwasher capable of washing 7,000 dishes per hour, a 40 gallon soup kettle and an 8 gallon coffee urn. A large ball room, a convention hall and a banquet hall were also features of the lavish hotel. The Royal Edward Arms was a successfully run hotel for many years. Many notable people spent nights at the hotel, with perhaps the most memorable visit being from the Royal Family; Queen Elizabeth II visited with Prince Charles in the 1950s and although they didn’t spend the night they did rent a day room. In the 1980s the hotel was converted to apartments. It is in the Art Deco style. Although the exterior has a stucco or plaster look to it especially with the decorative work, the entire building is concrete. Slipform Construction technique is a sliding-form construction method of pouring vertical concrete structures. It begins with the construction of a fixed-diameter form on top of a foundation, with a back-up support and bracing system to ensure that the form maintains its shape during movement. Inside and outside forms create the cavity of the wall, and inside this cavity, reinforcing steel is tied together vertically and horizontally to reinforce the concrete wall. The form is then connected to jack rods with hydraulic jacks, which automatically move the form vertically in minute increments as the concrete is being poured. Once pouring begins, it continues until the top of the structure is reached, allowing for a large poured concrete structure. This method of construction is typically used on large-scale storage silos and other vertical concrete structures, such as elevator cores and batch houses. 201 May Street North – The Revenue Canada Building is associated with the federal government’s expansion of services into smaller communities, and with its provision of well designed, up-to-date facilities. 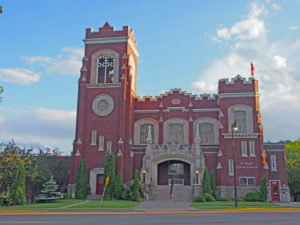 It was built from 1913-1916 when Fort William was one of the world’s largest grain-handling ports and a major trade and transportation point and railway terminal. The construction of the building reflects the unprecedented prosperity and optimism of the early twentieth century as well as the expansion of east-west trade and the economic importance of customs activities. 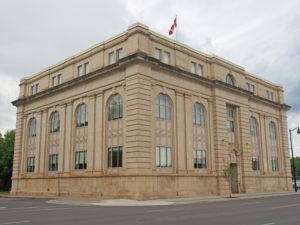 The Revenue Canada Building is an example of Beaux-Arts Classicism. This style was commonly used by the Department of Public Works for public institutions in the early twentieth century. 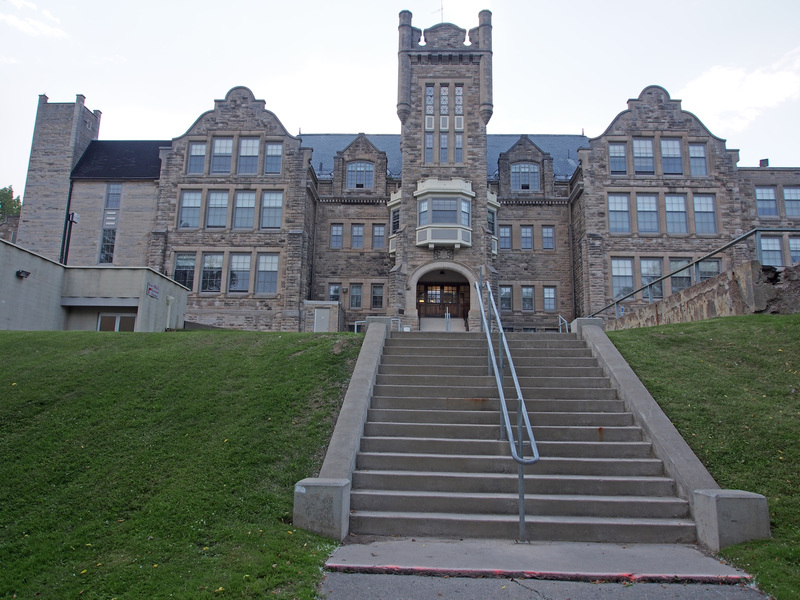 The building’s good craftsmanship and materials are demonstrated in its use of pale limestone veneer and granite accents on the two principal elevations and in the masonry details. 425 Donald Street East – Thunder Bay Museum – The Police Station and Court House was built in 1912. 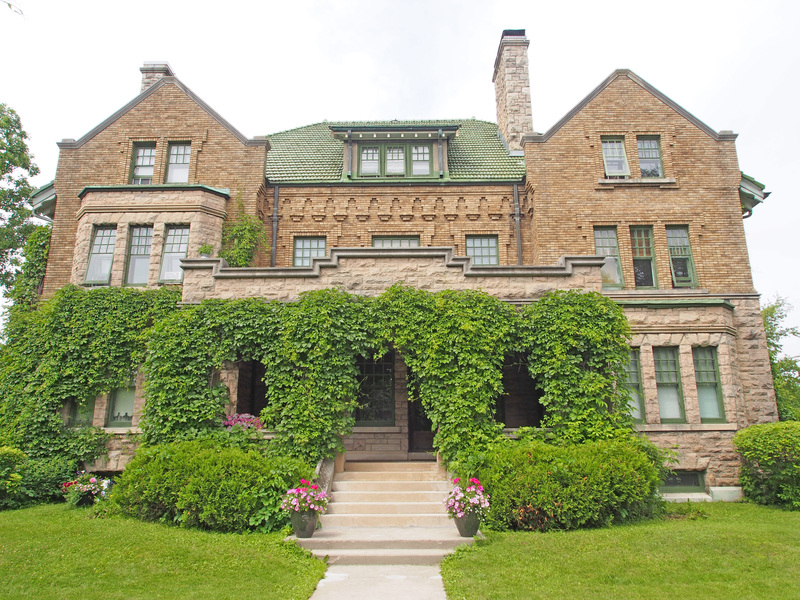 It is an example of the Edwardian Classical style of architecture. It had enough space for a Court room, separate cell blocks for men, women and juveniles, law clerk and magistrate offices as well as a public hall for meetings. A wide flight of curving stone stairs surrounded by a solid, stepped stone parapet leads to an imposing portico. Subdivided into three sections, the central portion of the façade is recessed and framed by two massive columns. The free standing columns rise two stories and are accented by two pilasters that are attached to the façade wall on both sides of the entrance. The placement of these pilasters gives the impression that there are four columns instead of two, creating an interesting optical illusion. The pilasters are also crowned by carved acanthus leaves and small volutes. The tapered columns are adorned by Roman Corinthian capitals. The columns support a massive moulded architrave which extends across the façade; over the entrance is a pediment with a bull’s eye window. The date 1910 is in high relief on the broken pediment. The façade is rusticated stone up to the 2nd floor and the remainder of the façade is faced with Milton brick. 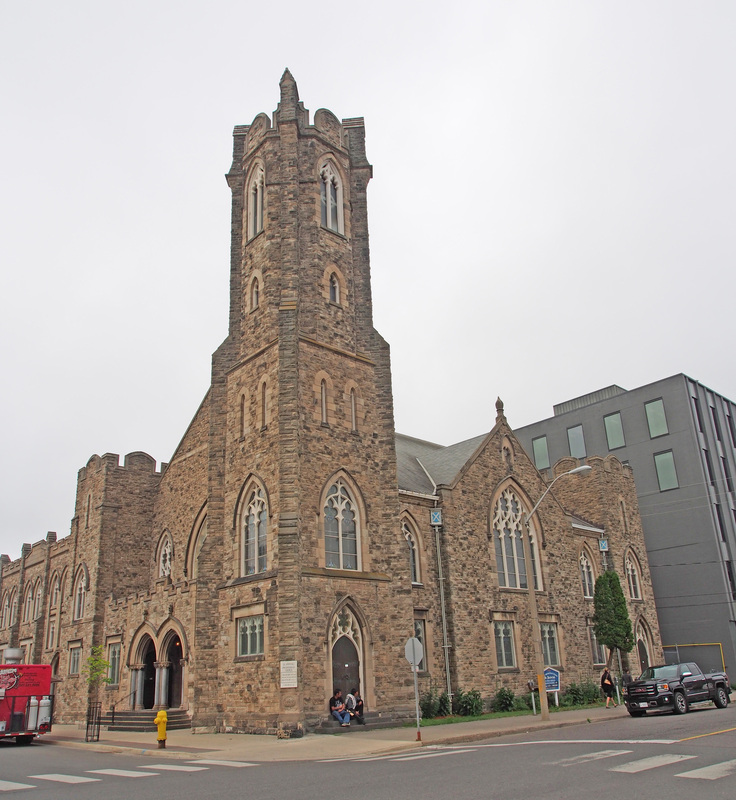 Although the windows of the upper portion of the façade have been altered, the stone sills and lintels remain intact. The old police station was renovated to house the Thunder Bay Museum. The major exhibits of the Museum, which opened in 1997, have ample space as additions have been made to the already fair-sized structure. Kakabeka Falls is a waterfall on the Kaministiquia River located thirty kilometers (nineteen miles) west of the city of Thunder Bay. The falls have a drop of forty meters (one hundred and thirty feet), cascading into a gorge. The name “Kakabeka” comes from the Ojibwe word meaning “waterfall over a cliff”. 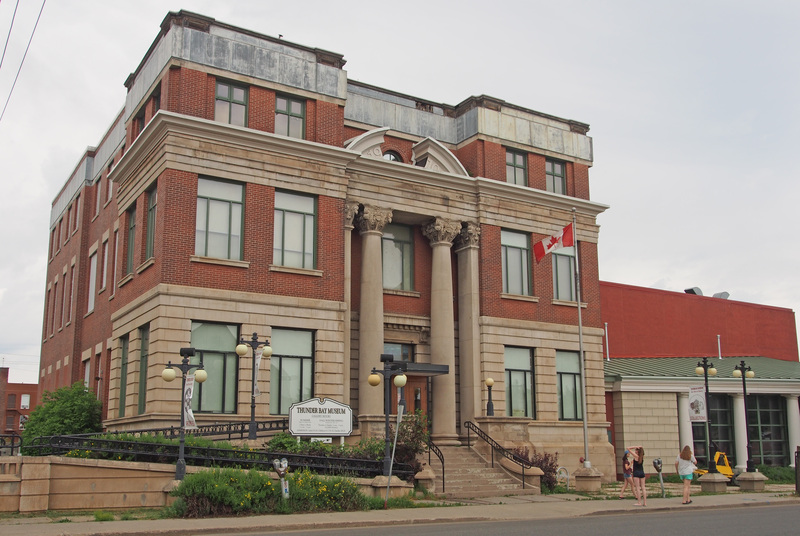 The City of Thunder Bay has three histories. The twin cities of Fort William and Port Arthur were amalgamated in 1970. 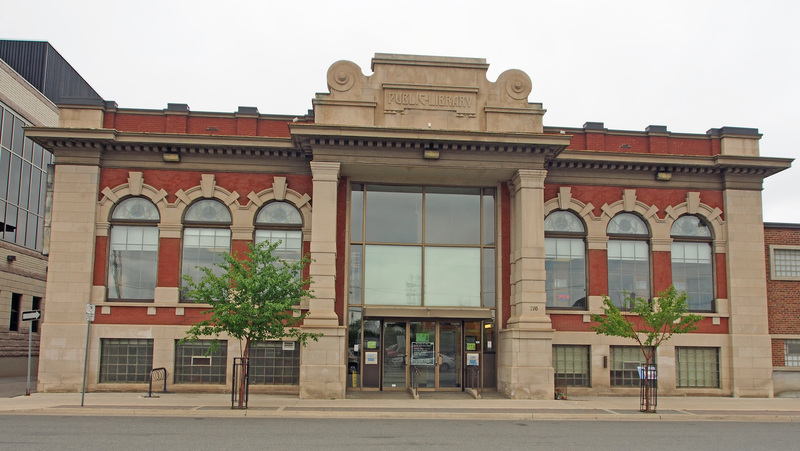 Thunder Bay’s past is linked with the parallel but separate pasts of the two cities. 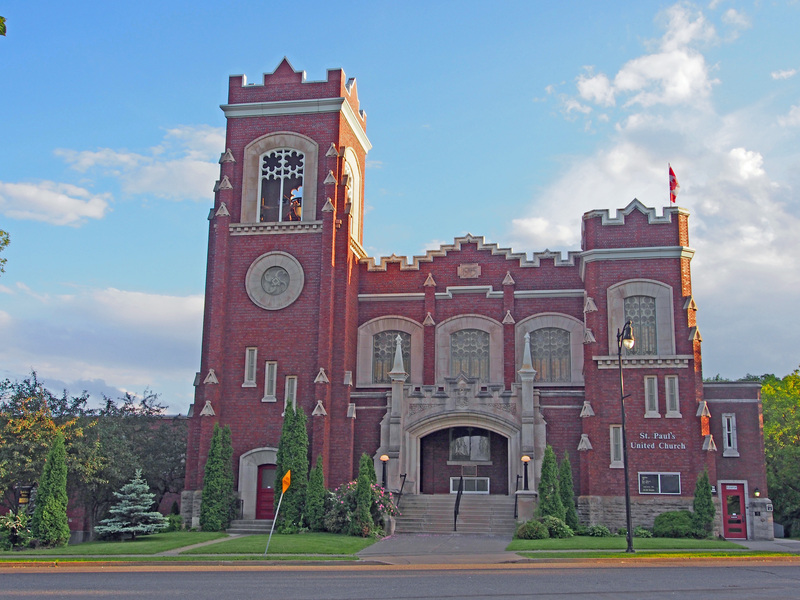 Port Arthur was a city in Northern Ontario which amalgamated with Fort William and the townships of Neebing and McIntyre to form the city of Thunder Bay in January 1970. With Confederation in 1867, Simon James Dawson was employed to construct a road and route from Thunder Bay on Lake Superior to the Red River Colony. The depot on the lake, where supplies were landed and stored acquired its first name in May 1870. It was named Prince Arthur’s Landing in honor of Prince Arthur, son of Queen Victoria who was serving with his regiment in Montreal. Prospering from the CPR railway construction boom of 1882–1885, Port Arthur was incorporated as a town in March 1884, one year after acquiring its new name. The CPR erected Thunder Bay’s and western Canada’s first terminal grain elevator on the bay in 1883. The end of CPR construction along the north shore of Lake Superior and the CPR’s decision to centralize its operations along the lower Kaministiquia River brought an end to Port Arthur’s prosperity. Silver mining had been the mainstay of the economy for most of the 1870s. The silver mining boom of the 1880s came to an end with the passage by the U.S. Congress of the McKinley Tariff in October 1890. 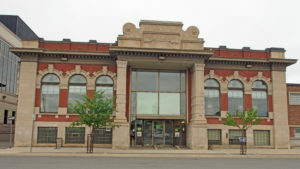 The town was in dire economic straits until 1897–1899 when the entrepreneurs William Mackenzie and Donald Mann acquired the Ontario and Rainy River Railway and the Port Arthur, Duluth and Western Railway, and chose Port Arthur as the Lake Superior headquarters for the Canadian Northern Railway. Port Arthur thrived as a trans-shipment and grain handling port for the CNR after the railway line was opened to Winnipeg in December 1901. 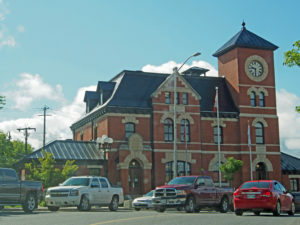 9 Water Street North – The Canadian National Railway Station was constructed in 1906 in the Chateauesque style. Brick is used on a symmetrical plan with Tyndall limestone used in the foundation and for decorative elements. 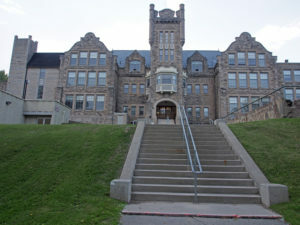 The solid symmetrical arrangement of the masses and windows, combined with the Scottish Baronial style (the most noticeable characteristic of which is the bartizan, an overhanging corner turret), very high pitched roofs, multiple dormer windows, and crenelated turrets qualify this building as being a prime example of the “Railroad Gothic style” developed by the railway companies at the beginning of the twentieth century and is uniquely Canadian. 9 Water Street North building end – The tower corners have bartizans with loophole windows, and stone bottoms and battlements. 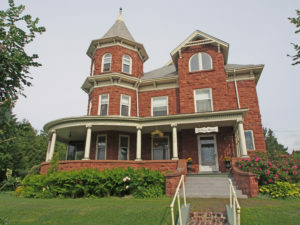 170 Red River Road – Above the entrance is a large carved stone panel with a beaver and maple leaves. 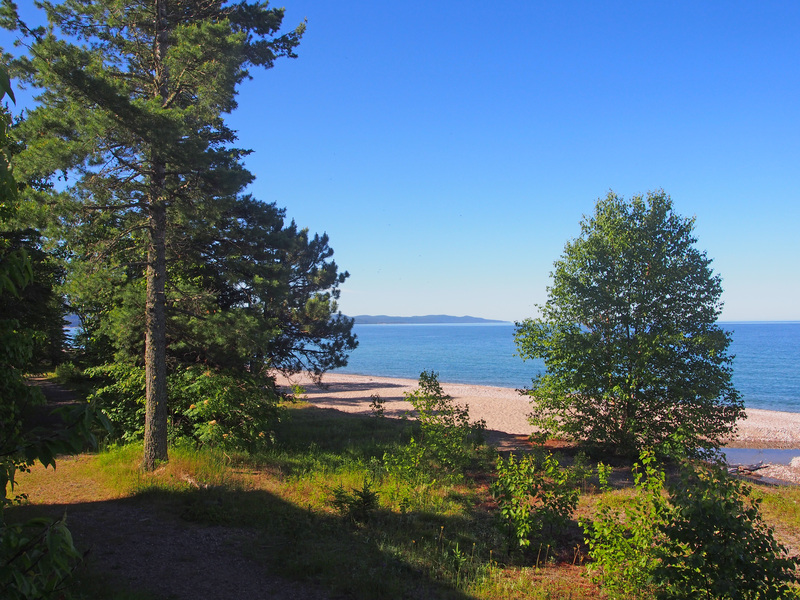 Lake Superior is the largest freshwater lake in the world by surface area, and the third largest in volume. If the coast of Lake Superior was unraveled into a highway, it would extend 2,939 kilometers (1826 miles). The deepest spot is 406 meters (1,322 feet). Lake Superior presented many challenges to shipping. As interest in the resources of the north grew, investors wanted a more reliable form of transportation and the Algoma Central Railway was built. 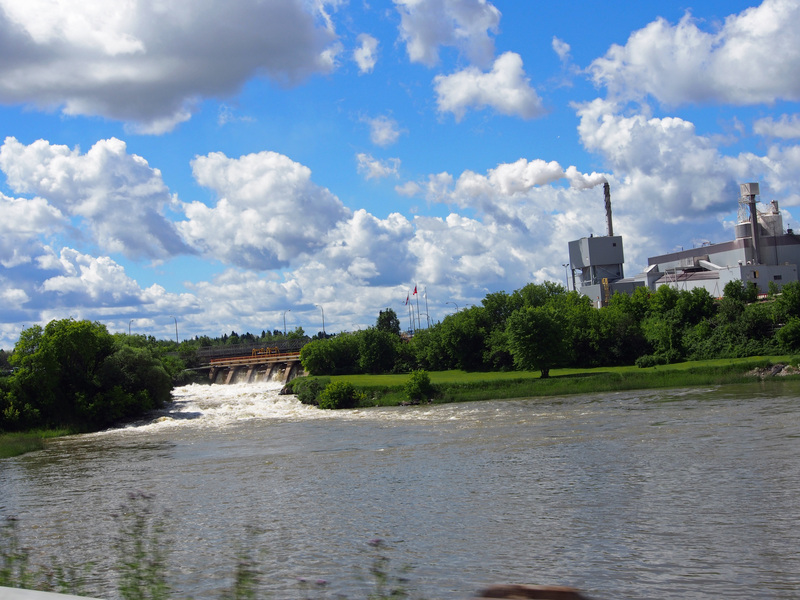 It was intended to bring iron ore and pulp logs from Wawa and Hearst to the mills of Sault Ste. Marie. With the completion of the railroad in 1914, loggers, tourists and artists traveled to places that had been difficult to reach. Before Lake Superior Provincial Park was created, a group of artists came to paint pictures of Canada. J.E.H. MacDonald found a multi-channeled falls which he painted showing the foam, the reflections, the colors and the magic. These artists were experimenting with new techniques that showed the ruggedness and beauty of the land. Each fall between 1918 and 1922, members of the Group of Seven painted the newly accessible landscape of the Algoma region as the railway was built. They lived in a rented boxcar and traveled up and down the railway in a three-wheeled handcart called a velocipede. A canoe took them to locations away from the track. The bold new style of painting used vibrant colors. The Agawa River Valley formed a natural pathway through the wilderness; a section of the railway follows the route through the Agawa Canyon. When the first Europeans traveled to the Wawa region in the late 1600s, they were introduced to a rugged landscape occupied by the Ojibway people. Wawa means clear water. Somewhere along the way wawa may have been mistranslated to wild goose instead of wewe which means snow goose. 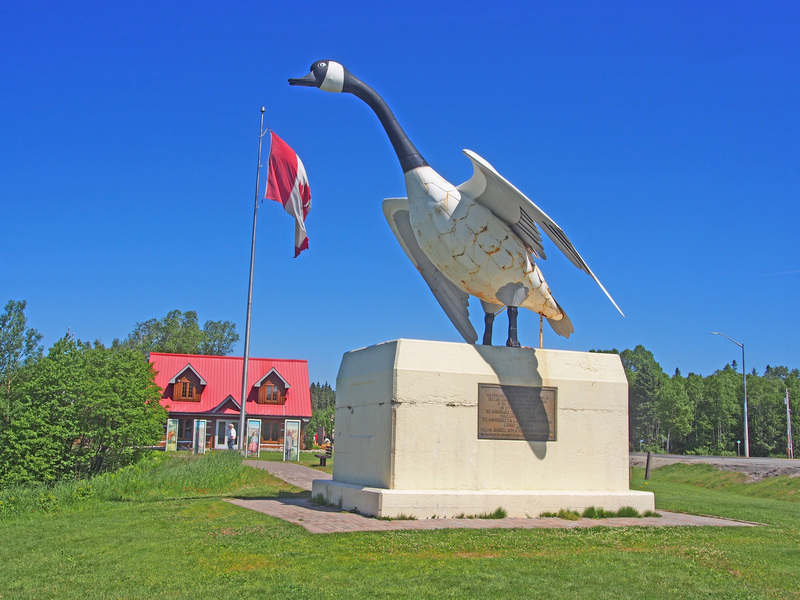 The wild goose story stuck and thus was born Wawa’s legendary Wawa Goose. 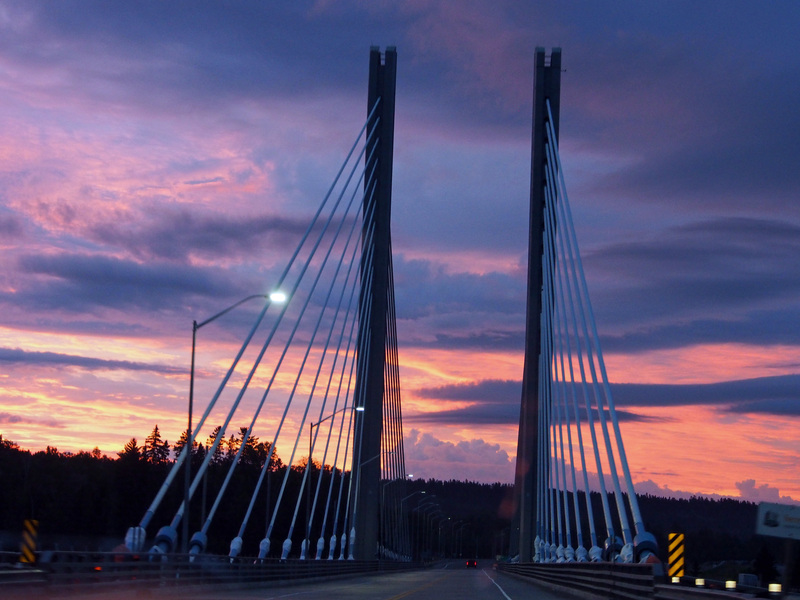 Kenora is a small city situated on the Lake of the Woods in Northwestern Ontario, close to the Manitoba border. 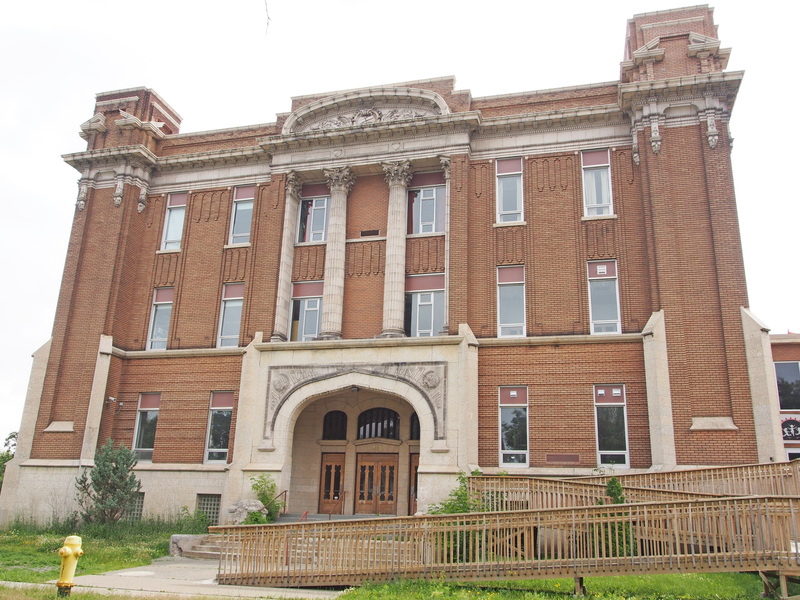 It is about two hundred kilometers (124 miles) east of Winnipeg. Kenora’s future site was in the territory of the Ojibway when the first European, Jacques de Novon, sighted Lake of the Woods in 1688. Pierre La Verendrye established a French trading post, Fort St. Charles, to the south of present-day Kenora near the current Canada/United States border in 1732, and France maintained the post until 1763 when it lost the territory to the British in the Seven Years’ War. 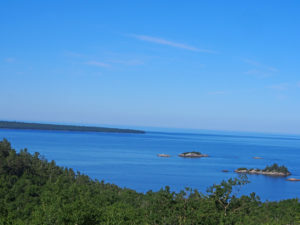 In 1836 the Hudson’s Bay Company established a post on Old Fort Island, and in 1861, the Company opened a post on the mainland at Kenora’s current location. 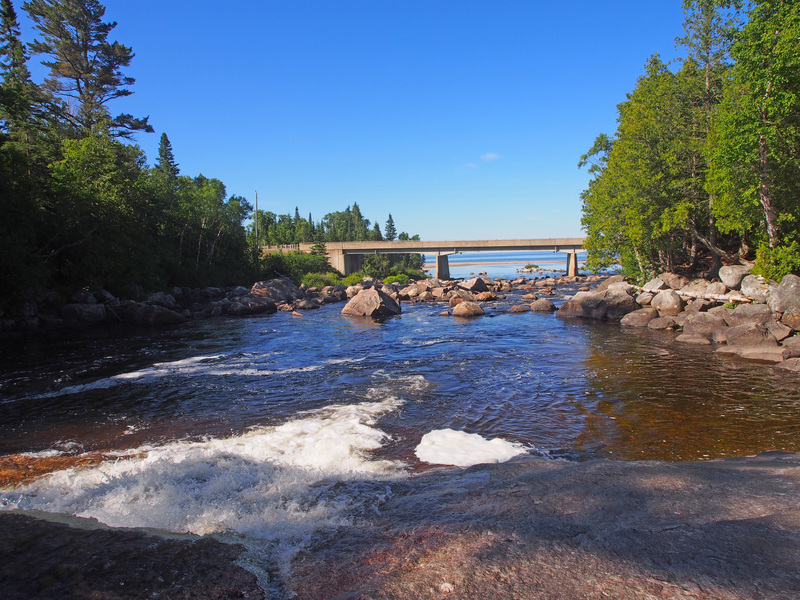 In 1878, the company surveyed lots for the permanent settlement of Rat Portage (“portage to the country of the muskrat”) — the community kept that name until 1905, when it was renamed Kenora. Gold and the railroad were both important in the community’s early history: gold was first discovered in the area in 1850, and by 1893, twenty mines were operating within 24 kilometers (15 miles) of the town. The first Canadian ocean-to-ocean train passed through in 1886 on the Canadian Pacific Railway. 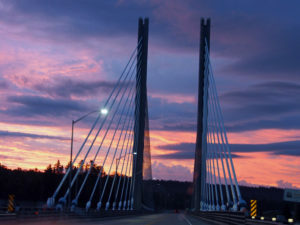 A highway was built through Kenora in 1932, becoming part of Canada’s first coast-to-coast highway in 1943, and then part of the Trans-Canada Highway. In 1967, the year of the Canadian Centennial, Kenora erected a sculpture known as Husky the Muskie. It has become the town’s mascot and one of its most recognizable features. 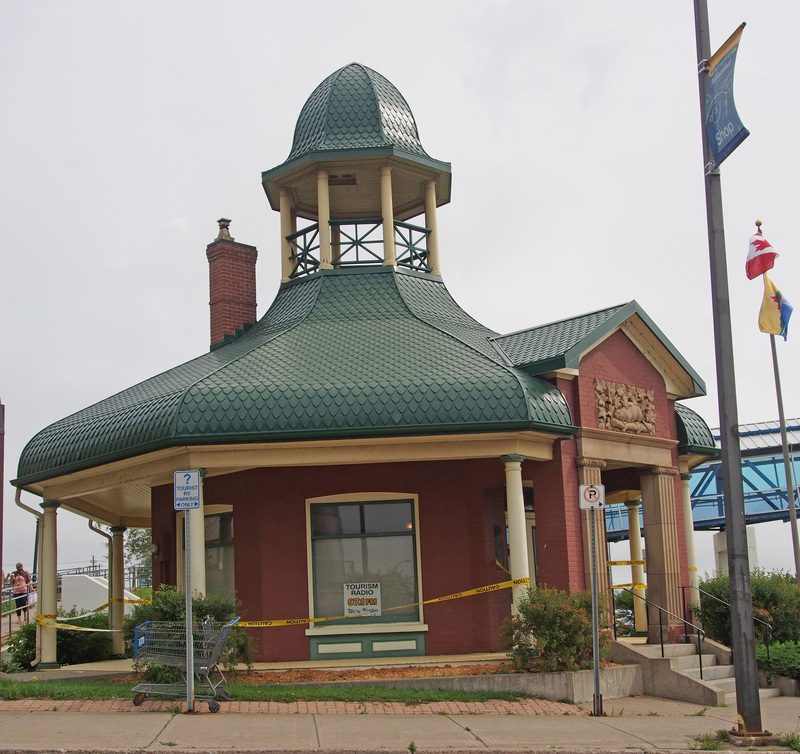 A dramatic bank robbery took place in Kenora on May 10, 1973. An unknown man entered the Canadian Imperial Bank of Commerce heavily armed. After robbing the bank, the robber was preparing to enter a city vehicle driven by undercover police officer Don Milliard. A sniper positioned across the street shot the robber causing the explosives he was carrying to detonate and kill the robber. Most of the windows on the shops on the main street were shattered as a result of the blast. Dryden is the second-largest city in the Kenora District of Northwestern Ontario. It is located on Wabigoon Lake. The Dryden area is part of the Ojibway nation, which covers a large area from Lake Huron in the east to Lake of the Woods and beyond. The Ojibway are nomadic with groups from family to village size moving over the land with the seasons and the availability of game or the necessities of life. The settlement was founded as an agricultural community by John Dryden, Ontario’s Minister of Agriculture in 1895. 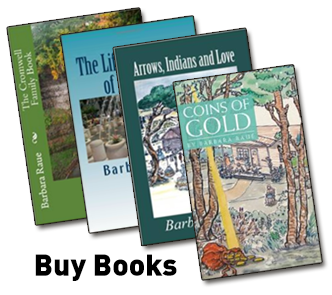 While his train was stopped at what was then known as Barclay Tank to re-water, he noticed clover growing and decided to found an experimental farm the following year. The farm’s success brought settlers from other areas and the community came to be known as New Prospect. Pulp and paper came to the town in 1910. Today, its main industries are agriculture, tourism and mining. The town was the site of the March 10, 1989 crash of Air Ontario Flight 1363 which killed twenty-four people. Dryden is known by people passing by as the home of “Max the Moose”, Dryden’s 5.6 meters (18 foot) high mascot on the Trans-Canada Highway. 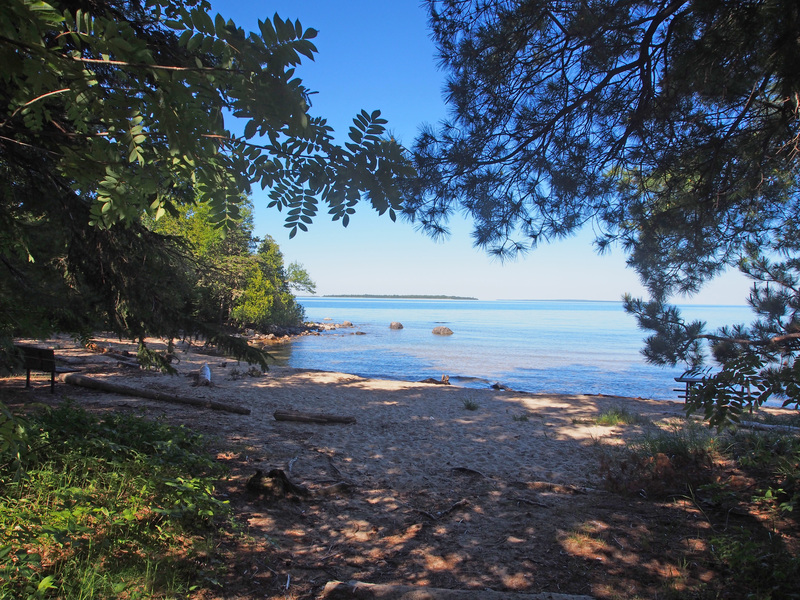 To the Ojibway, this river of fine white sand was known as Pinguisibi. Here in the shelter of the Lizard Islands, the waters are warmer and shallower. The sand beaches of Katherine Cove are a great place for relaxing and having a picnic. The famous Wawa Goose gazes out over the Trans-Canada Highway as it carries traffic through the Magpie River Valley. The Magpie River travels about one hundred and thirty kilometers over a number of scenic waterfalls (Steephill Falls, Magpie High Falls, and Silver Falls) until it merges with the Michipicoten River half a kilometer from its mouth on Lake Superior.